In November, a stylist gave me a cut. Here, I was working back to where I was pre-cut. Note: my hair on March 12, 2011 was oily and as my hair is fine, the strands stick together when oily, thus making my hair appear thinner than it really is. August 4, 2012 — so close to waist length! October 11, 2012 — grazing waist length! Note: Hi there, all length checks above this line are when I was fully relaxed. I transitioned to natural from June 2013-April 2015. All photos below this line are of my hair fully natural. I have switched to a new length check shirt with lines that start further up for my length checks going forward. Is this the longest your hair has ever been or before you started your journey it remained at a certain length seemingly not growing? My hair never grew past shoulder length before starting my journey. My hair is fine though and moderate thickness so I’m worried that will pose a problem in retaining length.. fine hair is so fragile. What amazing progress, I can't wait to see how long I can grow! So inspirational. What products did you use and what was your regimen also did you use any hair growth methods such as Inversion Baggying etc? Jennifer is my undisputed hair care champ. I have developed a hair obsession and am now taking my hair growth very seriously. I want to begin texlaxing my hair myself, these hairstylists aint loyal. I love my hair more than they ever will. Heres my question: my last relax was end of August 2014. I want to try go without a relax for all of 2015 with the help of braids and maybe weaves..thereafter start to texlax the visible growth. Do you think I will be doing more harm than good by doing this? I am desperate for thickness and health. I am certain that the length will follow naturally thereafter. Am I wrong? Hey, I was reading some of your earlier comments and I saw that you said that you only straighten 2 to 3 times a year. Do you wear your hair natural the rest of the time? i live in Africa and can not get even half the things you are using for your hair, and honestly i dont understand some of the things you say you do to your hair….i love your hair and the texture is similar to mine, but ow do i get to that length? i would love to have long hair, are there not other things i can use apart from the products u mention?maybe ingredients i could put together? If I'm correct braiding retains hair growth Right? I've been moisturizing my hair and braiding in extentions since I was little. I'm 13 now.I don't do micro braids because when you take them out it breaks your afro. I'm not mixed race but have fine hair if that helps. Right now my hair is just past my shoulders if a pull on it. It's the only way to see progress since I have never relaxed it before. I really thought my hair would be even longer now since I always moisturize to help keep it strong and i never have expierenced damage. is there something I'm doing wrong or is it just the way my hair is? Any words of wisdom and advice would be greatly appreciated! P.S. they are also little mermaids and its difficult to keep them out of the pool! I can not wait to reach waist length!!! your hair is so beautiful!!! so glad i found your blog!! happy hair journey!! I watched you video like six times! After finding a ball of knots in my hair because the shedding hair has trouble leaving my coils, I decided to texlax. I have stocked on both my favorite products and some of your recommended list. Last question left from your video: I did not see you smooth in the vaseline. What do you mean by the technique of putting vaseline on your new growth (NG)? Do you just put it at the parts or thoroughly through all new growth. I did not see that in your process very well. i loveeeeeee your blog!!!! i'm also trying to grow my hair hip length! Hi Jen! I love your blog and I love how quickly your hair grew. You're hair looks very health and pretty. What did you do to get your hair to grow so much in Mar 09 to Nov 09? Hello!!! I have been trying to grow my hair out for years without success, and stumbled upon your website. I have purchased some of the products that you are using, and have even began trying out the coffee/tea rinse which is amazing. Do you have any other pointer for a first timer? 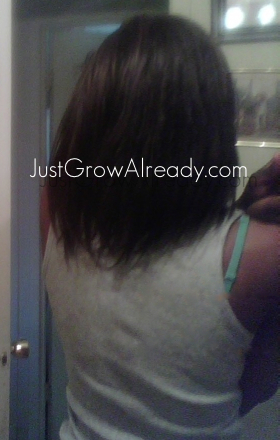 I think I am about 12 weeks post relaxer, I have VERY thick hair that breaks easily. I don't know whether or not if it's because I'm bi-racial or what. How often in between relaxers would you suggest washing, and what moisturizers would you recommend for thick hair and dry scalp. Plus is there a certain amount of coffee to tea ratio that you use? I have a tendency to overdo things sometimes, and do not want to use too much. AMAAAAZZZIIIINNNGGGG! 🙂 this gives me so much hope. So I startled texlaxing in June because I too have dense fine hair and my hair dresser always relaxed it bone straight. NO BUENO! So question do you smooth the relaxer at all when you do your touch up or do you just put it on without smoothing? Also is your hair flat ironed in those pics? It's seems like all texlaxed ladies iron their hair which is something I personal DON'T want to do. I kind of feel like the relaxer is enough manipulation. So is there a way to achieve your nice, full straight look like the pics without having to add excessive heat? Ok I absolutely love your hair! I've been natural for 6 months now, I like it and all but i will be honest. I miss relaxing, I just don't want to do it every 6 weeks no more. What can you recommend to me. My hair is now virgin it's super duper thick, and with my pain all this twisting and everything just to get a curl pattern is driving me nuts. 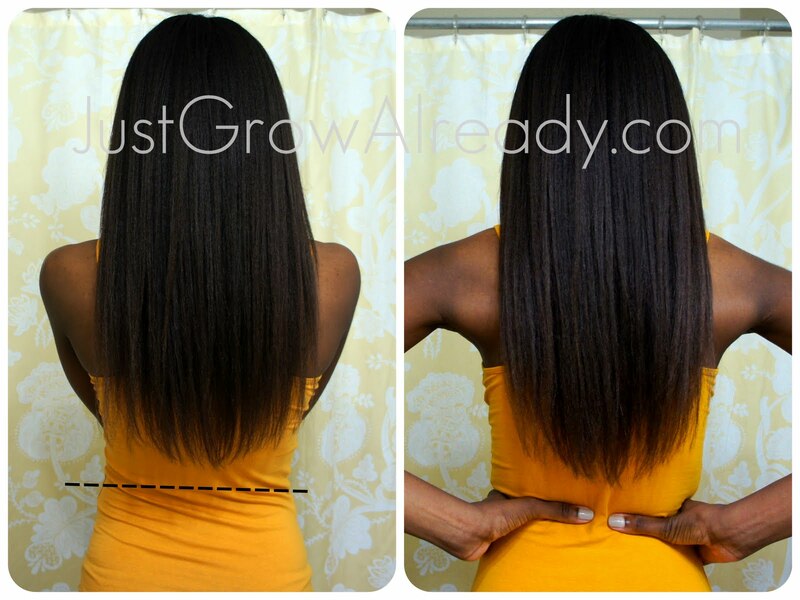 I want healthy hair like yours using less relaxer. I have a tub of Affirm mild sensitive skin, and all the supplies needed for it. Please help me get started should I apply all over my hair? I know how to relax but I've never stated with virgin hair. 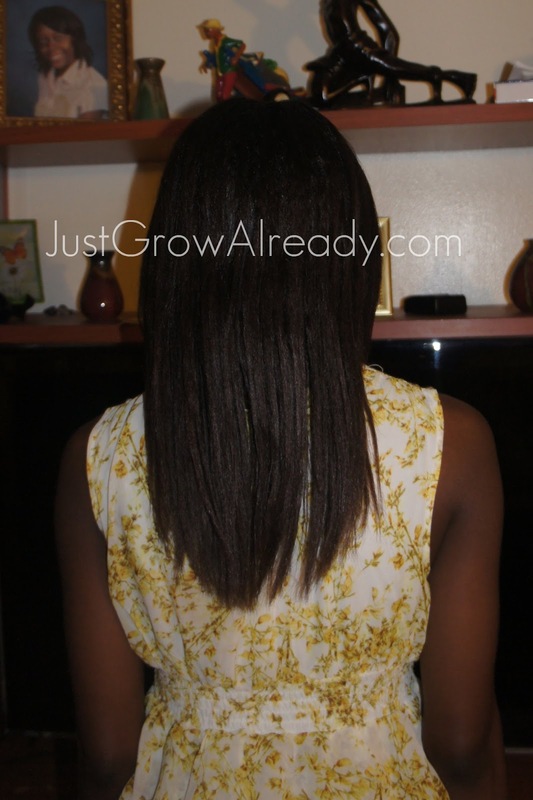 • Use a mild relaxer that you will know will under process your hair. • Add oils or conditioner to the relaxer (applicable to both lye and no-lye relaxers) to weaken it. • For no-lye relaxers: reduce the amount of activator you add, thereby weakening the relaxer’s strength. • Apply vaseline/petroleum jelly to hairh. • Limit the time relaxer is on your hair. For example, if the instructions indicate that the relaxer should be left on for 15 minutes, shorten that time. Determining how texlaxed you want to go: Take a few shed strands of hair, because I don’t want you pulling out strands that are perfect content to stay connected to your scalp lol, and using any of the methods above, apply relaxer to the new growth on the strands. 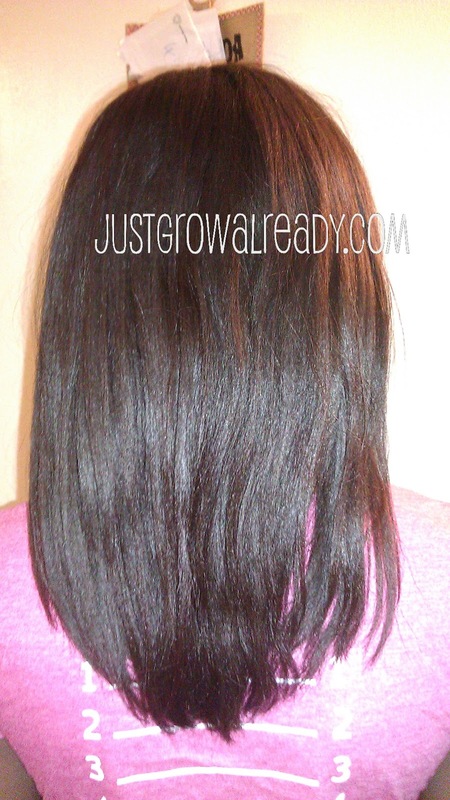 Play around with how long you leave the relaxer on the hair, smoothing, technique, etc. until you achieve your desired results. I was going to chop my hair bc I wanted to try for a job promotion & all the execs have shorter hair. Thank you for this blog. I need to be true to myself & keep my long locks. Your hair progress chart is great! My husband took a look at it and scoffed "my hair grows that long in 2 years!". I almost punched him. Thanks Anon! My cousin says the same thing haha. omgosh!! i love ur hair! there is hope!! i was thinking of transitioning but after going through ur pages i think i'll opt for sticking to terlaxing and following a strict hair regimen. uhm, quick question, would you recommend Wild Growth Hair Oil? Just wanted to say that i think your hair is beautiful. im trying to grow mine out as well but i just had about 3 inches chopped off because of split ends. How do I deal with those? please help! Thank you! I deep condition twice a week, washing every weekend. Your hair is lovely! I stumbled across your blog the other day and looked around, and had more time to check it out today. I am on a mission to grow my hair longer! I was inspired by a video blogger named found via YouTube at SimplYounique and after viewing some of her videos and hair care tips, I decided to cut off my damaged hair and start fresh with an even length all around. I'll be checking back with your site :] Very cute blog name, by the way! Everyone is ignoring the fact that in your last relaxer update you are mid back and not waistlength. You're wrong, waist length is the smallest part of your torso and that's where Jeni's hair rests at her last update, so there's nothing to ignore. You might be confusing her waist for her hip which is where her bottom finger rests. I'm glad you replied because that honestly annoyed me. Why even bring that type of energy to Jen's page? If you can't say anything nice or you think you're being misled in some way, just leave the site and never return. Simple. You know, you learn something new everyday. Sometimes, when I don't know things I tend to ask questions first but never try to come at someone in an accusatory tone. I just stumbled on your blog and I'm soaking in all the great information. My relaxed hair is currently at bra level but aiming for longer. I'm 10 wks post relaxer and I just received my hair journal so I can't wait to begin recording my progress. Wish me luck! Thank you for sharing. I appreciate! So 4 years down the road…..your progress is amazing!! I just hope I can get something close to yours in the same time……!! Reta, I started my journey with very short damaged hair and right now I'm full shoulder length, aiming towards armpit length by the end of the year. If you start your journey and do your research and you are constantly vigilant regarding how you trat and care for your hair, then you too can reach hairgoals previously you wouldn't have dreamed off. Just have some faith and put in the work. You can check out my blog (therandomphoenix.blogspot.com) as well if you really want to see someone who didn't start her journey with SL hair. You recommend for weak hair edges ? beautiful hair maam, much growth success…how about a forward shampoo over the tub, would like to see how long it is when its wet. Hi Jen,I must say hair is my new obsession. Seriously it is, a few months ago i decided to actively grow my hair. But that was really just because i was so tired of putting my hair in a weave or braids and fine id see dat my hair had grown quite abit wen i take them off but they'd eat my hairline ryt up. Anyway i firstly jus started by not flat ironing my hair much, then i kinda got lazy wit all the combing coz i honestly used to basically b allergic to combing my hair n leaving it out so i bought a fake ponytail to jazz up my look. then one day i was on facebook which led me to the beautiful world of growing your own hair and a whole load of connections to websites and blogs n i decided instantly that i would start a hair journey for real… its bin exciting change tho i had to ditch d laziness and the bad practices to the curb: washin my hair once a month mayb evn once every month n a half (moisturising and protein treatments even less) (ewwww ryt) relaxing hair at d salon ryt down to the end of the shaft (no wonder my hair was thinning) this will be the 4th week of my journey and i relax my hair in 2weeks coz im already 12weeks post my last relaxer(which iv always done). since almost 4weeks ago iv been washing my hair twice a week day 1 is prepoo, shampoo, condition then deep moisturising conditioner, day 2 is deep protein conditioner then i co wash. the oils iv been using are castor and coconut. yesterday i added grapeseed oil to that ryt after bumping into ur site online through a link from another blog. i did the prepoo and made it a hot oil treatment with all three including ors vital repair oil mix. my hair feels quite soft tho its still airdrying here at work lol. i also dumped petrolatum and mineral oils and made my own leave in cond with the aloe vera rose water glycerin mix. i use ors carrot oil to moisturise. coconut and now grapeseed to seal castor to oil my scalp. thanx for all the great info, youve joined the list off my hair idols with dabs from naija hair can grow and dr fomsky from sizzling mom and it hasnt even been 24hrs since i discovered this site. thanx a billion….i have bags under my eyes from stalking your site last nyt and i clearly havnt stopped hahahaa. Ps, what do you think of my regimen? and im abit confused as what to do wen i finally relax, im not too sure of d texlax thing…it sounds like a good idea but i dunno if i wanna go ther yet. so think i shld jus start by relaxing new growth only and as the rest of my hair thickens il see if texlaxing is really a good idea for me (sorry bout d long long long mail) my excitement is bleeding through. That was really hard to read. It would have been easier if you had written the message in clear English. Stop being jerky to people. Your blog is excellent, I am a new reader and I have already learned alot from you. Thanks for sharing!! There are still quite alot of misconceptions about growing black hair and relaxing hair which is influenced greatly by the hair care companies we have in South Africa. It is really difficult to convince people not to use heat everyday, pre-poo, avoid products with mineral oil etc in South Africa. I recently had my hair relaxed at a salon and I had to tell my stylist what to do and what not to do…at the end of my appointment I directed him to your blog and other black hair care blogs. Thank-you for dispelling some of the myths and misconceptions about black hair and I am hoping the healthy hair movement grows in South Africa. Stay blessed, Nwabisa from Cape Town. What a beautiful blog! What a beautiful person! Thank you! Amazing! I'm interested in knowing if one can expect the same/similar results with natural hair? I stopped chemical relaxing about 3.5 years ago. That was a HUGE step for me, and my hair has grown quite a lot. However, I use the flat iron 1-2x a week. Oh, and I take the GNC hair vitamins also. Do you think that when your doing your length checks you could try to always wear the measuring shirt? It's just much easier to see the growth you have in the allotted time between the pictures and also helps me compare with mine. oh sorry i forgot to ask what does HHL mean………I am new to all of this. Also do u at times put your hair in a weave? if so how often do you fix a weave? Do you mean HHJ? It means healthy hair journey. No I don't use weave. I'm really tender-headed and avoid cornrowing my hair. i think its great that you reply to over 90% of the comments left on your blog. So just wanted to let you know that you are indeed valved and appreciated. from a 28 yr old Nigerian fan. Thanks for your comment Lucy! 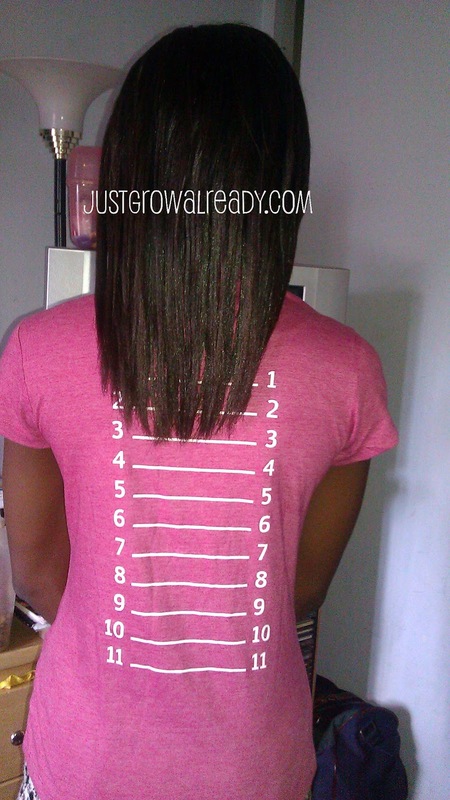 I just ordered one of your Hair Length T-Shirts and am revamping my blog…You are very inspirational!! The majority of my posts came from questions I receive, especially from the "picking your brain" submissions. I started it because I had writers block, haha. Reader feedback is a great source of blog inspiration. You've probably heard this a gazillion times already, but so glad I found your blog. Very inspired! Both my daughters have long hair, but I cut my own hair short last year, just wanting to find out what that would be like. BIG MISTAKE! Growing it all back now. What a great resource you have here. Putting you in my Google reader. Thanks! Thank you! Wishing you the best on your growth! Thanks for posting the line chart for the hair progress shirts . As of my last relaxer yesterday I am at line 9 and was debating with myself if I made to to MBL. My hhj started 07/2011 with sl damaged hair and I have learned so much from bloggers like you . I have learned more in the last year about how to care for afro textured hair than I have more whole life. I even did my first saran wrap rollerset yesterday using tips from your blog. It came out great I could not believe it …my hair will never see a flat iron again. Saran wrap is such a great way to achieve smooth/straight results without direct heat, glad to hear it worked well for you! Hi Jenijen. My ends are so raggedy even after I would cut them. As soon as I put my hair into a bun my ends would get real raggedy. Its there any suggestions as to how to keep them healthy and looking healthy???? BTW I love you hair. Thank you! I suggest keeping them moisturized, sealing with an oil that contains ceramides (like grapeseed, hemp seed, safflower oil). Ceramides help smooth the cuticles of the hair shaft for smoother hair. I love hemp seed oil on my ends. Hope this helps! Hi Jenijen. My ends always get so ragady and breaks off, even after cutting or reining them. Do you know what causes this to happen? Hi there, i've found my ends break when they're dry and weak. Are you moisturizing and sealing? Organix Coconut Milk Anti-Breakage Serum is really great, I like to apply it to my ends to strengthen them. Thank you for making this blog! It's awesome! Hi Jenn your hair is amazing where can I get that grapeseed oil from, is it the natural one or just the one I can buy in the tube form the hair store/sallys? Also what's your opinion on going natural? I am 6 months post relaxer and I cant go on cause I have some breakage going on, I saw your website I want to try stretching the perms out to see if my hair will grow lik how it use to grow. It's 100% pure grapeseed. You can find it in local markets (cooking oil aisle) and online (I've ordered from vitacost.com and Amazon). Re: my opinion on going natural – I'm all for transitioning to natural. I think natural hair is absolutely beautiful and will transition eventually (some time in the far future). Question about buns (you probably have the answer somewhere on here) what is the proper way to bun relaxed hair? My hair is SL but shedding like crazy don't know how to fix that… But I do recognize that I need to wear it up more often. My hubby prefers it down but I'm thinking if can figure out how to do a cute bun he'll be alright. Lol. One last question- how do you keep your edges and nape from looking rough during a stretch? You're no real proper way to bun, it's just whatever works for you. The goal is to protect the ends and have them tucked away, so however you're able to accomplish that is just fine. Try garlic oil (hot oil treatments or take as supplements) and black tea rinses for the shedding. I keep them both areas moisturized and I tied my edges down with my scarf at night. When I'm deep in stretch my edges do go a little rouge but when I air dry on wash days and tie my edges down while wet, they dry flat and stay pretty tame during the week, partly because I don't comb through my hair during the week. Hi Ivy, I've told many readers this (because it's absolutely true haha) but I thank you all because y'all keep me consistent! Posting here keeps me on track! I rely big time on buns during the winter because it pulls my ends up and way from wool and cotton that can easily snag my hair. You have lovely hair! it appears that you naturally have long hair based on genetics. Did you ever have short hard to grow out hair? or as a child did you always have long plats and pony tails? Not all women are predisposed to have long waist length hair without the intervention of vitamin or herbal remedies. Please disclose…. Thank you. Nope no long braids/hair as a child. My hair was shoulder length until I started my HHJ in March 2009. I don't believe i'm genetically predispose to have long hair, what made the difference was proper hair care practices and knowledge. Great progress! You have less than 2 inches to go before you hit waist length. Your hair is silky, healthy and shiny. You are doing a great job with your lovely hair and it shows. Keep doing what you are doing! You will be beyond waist length sooner than you think. This blog is inspiring and encouraging because of the documented results. You are helping a lot of people to change their thinking about their own hair and the possibilities. Thank you!! I truly appreciate your comment. JGA started out as a personal hair diary but it's been amazing to see the blog grow. I'm happy to help however I can. Hi, I discovered you via Simply Into My Hair! Your hair is very beautiful and so healthy!! Looks like your hair is growing in leaps and bounds this year!!! I'm natural (12 years), but I always think of how those with relaxed or texlaxed hair would benefit from using the same practices (DC'ing regularly, protective styles that keep ends tucked/off clothing-shoulders, sulfate free shampoo, moisturizing and sealing, etc.). I love my natural hair and my strands are fine, so relaxing wasn't for me. Even when I did do it from 13-27, I only did it twice a year … so I was always "stretching" unbeknownst to me!! LOL!!! And, I was wearing my hair curly from my early 20s b/c I worked out a lot and it wouldn't stay straight anyway (porous and the humidity and rain in NJ turned it into a puff most times of the year). But, anyway, I just love seeing the results of HHJ on all hair, natural, relaxed or texlaxed! Continued success!! I love that healthy hair care practices benefit all across the board!! My fine strands are the biggest reason I switched to texlaxing to retrain more texture and thickness. God bless! Your hair was on barely on the 4 inch marker in May 2011 and it's only a little past the 7 inch marker in May 2012. That's only 3 inches in a year? Are you a slow grower or did you trim a lot? I'm experiencing breakage at the nape of my neck. I didn't notice it until a few nights ago when I was moisturizing my scalp. Do you have any tips on how I can get that section of my hair back to being healthy again? 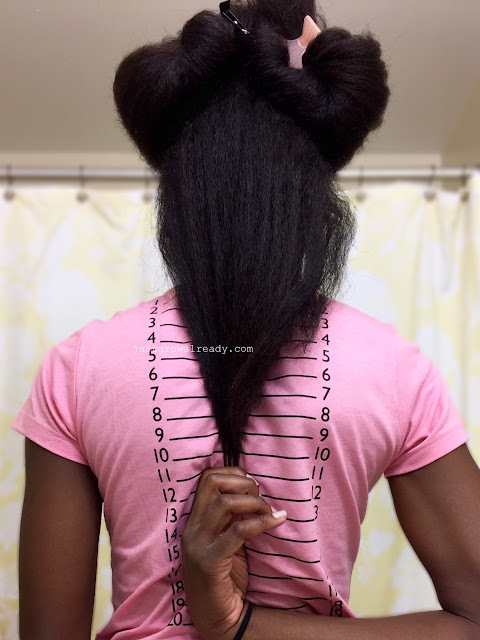 I started a personal nape challenge in January because I was experiencing breakage at my nape as well. What I've found most helpful is babying my nape, making sure I keep it moisturized, and I've also found that using Organix Coconut Milk Anti-Breakage Serum has been working well, lives up to its promises and helps stops breakage. Hope this help! Thanks so much for the advice, I'm going to look into buying a bottle of the anti-breakage serum cause lawd knows I need it. I'm Gee Gee, I like several other bloggers am a new reader of your blog. I must say I have been very discouraged about the state of my hair. I am just getting started on an official hair journey. Seems as if I always get my hair to a certain length and for some reason it just pops off. Since I have been doing research over the last month or so, I see that there are a lot of differences in what I have/have not been doing and what the lady's with the long locks have/have not been doing. I think I have a grip on it now. My biggest thing is to put the heat away for good. I think I can get great progress just by eliminating that. You are an inspiration to me. I have SL hair but it is not as healthy as I want it to be and I know that's all from heat damage. So first and formost, I am going to conentrate on getting my hair healthy. Your tips are going to be quite helpful to me. Keep up the great growing practices, I need the support. Hi I love this blog i have really damaged hair! How did you get your hair so smooth after having dry hair? 🙂 Please reply thanks LOVE IT! Oils that contain ceramides (e.g. grapeseed oil, hemp seed oil) give me the smoothest hair during the week. I apply on dry hair, a little if i'm wearing my hair out. I'm a new reader of your blog and I am SO INSPIRED. I just started my hair journey about a month ago and reading your blog and looking at your videos/pics really keep me motivated. Regimens are hard to keep up with so you really need someone like yourself to keep a newbie like me on track. I was wondering how often do you flatiron your hair. Within this month, I've done it once and I felt so guilty. I flat iron 2-3 times a year. I've already done it once this year and I might do it once more for the year. Hi Jen! I've been stalking your blog since March this year. I was determined to make 2012 a year of health and length. My friend usually does my relaxers, but she was pregnant at the time and I didn't want to put her through that, and a salon was a no no. Some how I came across your self-relaxing video. 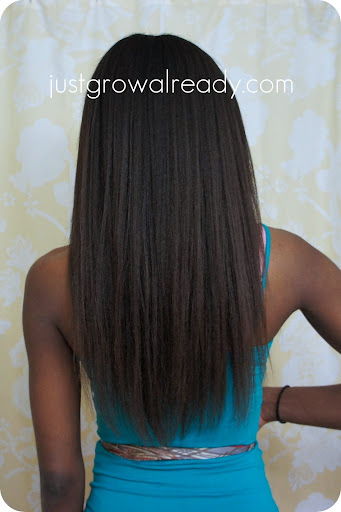 I have thick hair but I've been losing my thickness because I usually go for BONE straight hair. I watched your video over and over trying to muster up the courage to do my own relaxer. I did it in April but it came out texlaxed. LOL. 2 weeks after, I had finals and now I'm doing summer school. I'm totally neglecting my hair cuz I'm so busy. I came to your blog and immediately found renewed inspiration from your Progress Pics. I don't know if you know this, but I want to personally tell you that you inspire ladies like me to press on when feeling discouraged about my progress, motivated when the drive for healthy hair is just not there because school and life takes over,and you are a great help when we have questions or face challenges. You give the best advice you can based on your own experience. My hair is not fine like yours. I can scrub a pot with my thick, course hair. LOL. But, I use what knowledge I can gain from you. So this weekend, I'll treat my dry, brittle hair to a hot oil treatment, a good washing, serious deep conditioning, moisturizing and sealing and I'll find someone to braid my hair and wear a wig for protection for the second summer school into fall. Thank you for being so selfless and for sharing with us. I wish you great success on your life goals. Sincerely, Nev.
Hi, love your blog! Your hair gorgeous — you are my new hair idol. I am glad I stumbled upon your blog (saw your siggy on LHCF) because I could use the help. Was just reading through the comments, and I noticed where you said your scalp was damaged in '09. That's one of my issues now. I'd love to know what I can do to help it to heal. I stretch my relaxers to 10 to 12 weeks, but I know my scalp often has abrasions on it before I relaxing. Anyway, I'm rambling…once the scalp is damaged, what can be done to help heal it? (1) relaxing where you're experiencing scalp damage, last. If you're experiencing abrasions before relaxing, I'd definitely suggest checking with a dermatologist to make sure there isn't a serious underlying issue. Thanks. I believe that's what she's doing which is probably why i'm seeing some progress. Did you relax your nape any differently for it to grow so long and healthy? My nape hair is so much shorter than the rest of my hair but has been growing slow and steady, I just need to know how to instruct my stylist to get it long. When I first started out it was weaker than the rest of my hair so I applied relaxer to it last for nearly two years until I grew the damage out. I have been consistently having the relaxer applied on my name last and I'm excited to report that it's working!! My nape area is growing very well and because I just had a really good cut to even my hemline, my hair is no longer see through. I still have to trim about another inch for my hemline to be completely even. Thanks to hair boards and your blog, i'm finally seeing thickness and growth. Now, all I have to do is work on the front/middle portion of my hair and I will be well on my way. That is great!!!! I'm so happy for you! I've been on a healthy hair journey for one year but this past wknd, my hairstylist just chopped off all my "progress" in what was supposed to be a "trim" I went in with SL length hair and left with a bob 🙁 After that I wanted to give up but today I looked at your progress pics and decided to keep on with this journey…No more trims for me (well at least from scissor happy ppl)Your progress is very inspiring and I hope to have hair as beautiful and healthy as your own one day. Thanks for all the healthy hair advice! Just been looking through some of your old progress pics and pics of your hair prior to starting your hair journey. I don't know why I've never noticed the tabs to those pics before…..anyway…..it is so inspiring to see where you started out and where you are now. I've been thinking that your hair has always been as beautiful as it is now. Your progress pics show that anything is possible with the right regimen. I cringe when I look at what my hair was like prior to my HHG, not even length but health wise. And I used to think it was "okay." My ends were damages, my scalp was damaged (had an oversensitive spot at my nape due to overprocessing) Thank God for hair boards. I completely agree, the right regimen makes all the difference! Hi Jeni, Just a thought, could you do a Racerback Tank top for a length check shirt? Sure, I've added it. Because of the position of the straps, the length check markers are lower. hi, i'm new to your site. I absolutely love your hair!!! What gets me the most is that you got it to grow all within the time span of the first year (2009). How difficult was it starting? Did you buy all your hair products at the same time? Can the majority be found in stores? Jeni, you have truly inspired me!!! I'm currently going natural. I have very fine hair, shoulder length and i'm trying to frow it out to Bottom of bra strap at #6. What are the best ways to wear your hair during the day because my biggest problems are the dryness and split ends? I would love to keep you informed about my hair growth journey!! and Thank You so much for not being one of those sites that just wants your money and puts fake pics up lol God Bless You Jeni!! During the day I generally wear my hair in bun or pinned up in a claw clip to keep it off my shoulders to keep my clothing from drying out my ends. my hair is always oily 🙁 i cant get it to be fluffy like yours.. please help!! Hi Samm! I'm happy you like the blog! 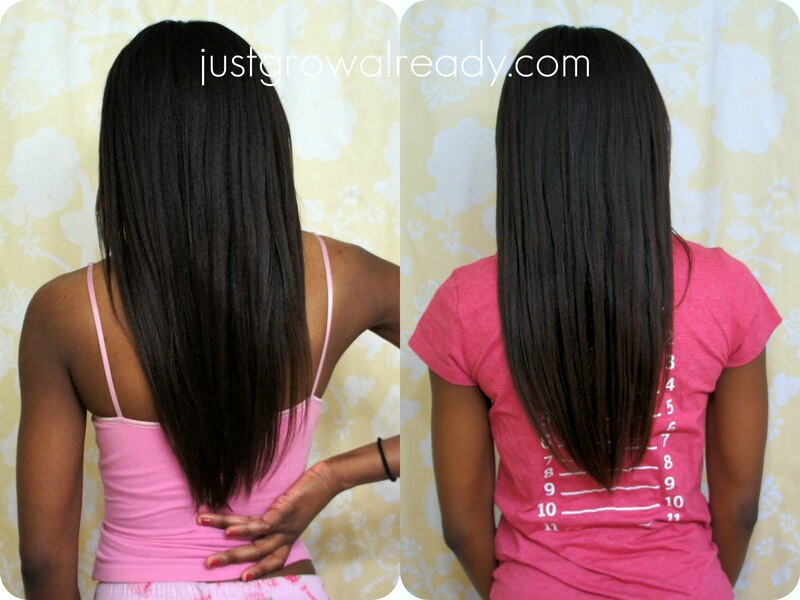 I would love to master my hair and stretch for 6 months. Good luck on your journey! Thank you, and yes. It's under the length check shirt tab. The one I'm wearing is the justgrowalready (dot) com shirt, but you can change the text or chose from one of the other length check shirts. HTH! I like the measuring shirt. Where did you get the shirt? Did you make it? Thank you! No I didn't have a set back, my hair in the middle was oily. I have fine strands that stick together when oily making my hair appear thinner. Hey !! its beautiful . Why does the center pic look so thin than the first . Did you have a set back ? I love the last pic really beautiful and the thickness awesome. What have you been doing to achieve all that thickness.